For business owners, multi-dwelling property managers and others who must maintain varying levels of security, master key systems offer the best combination of security and access for their properties. While old-school mechanical lock systems continue to provide quality protection, modern technology has helped to improve master key systems with electronic access, making it possible to track, customize and restrict access without having to call a locksmith service every time the configuration needs to be changed. In most basic terms, a master key system is one in which individual keys unlock certain doors, while a master key opens all the doors. This is a great solution for businesses in which employees should only have access to certain rooms, or in apartment communities or hotels where the supervisor requires access to all units for security and maintenance purposes. These systems have historically been designed by using multiple sets of pins within a mechanical lock; however, this presented a problem when individual keys were lost or not returned, requiring a mobile locksmith to come in to change the locks periodically. 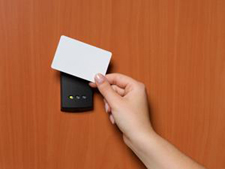 Nowadays, computerized access control systems are used more and more, in which card keys are coded to open certain locks at certain times, and can be programmed to stop working when a contractor is finished with his job or when a hotel guest checks out. Access control also allows the monitoring of entrances and exits, providing more security on the property and easier identification of breaches. In any system of doors and locks, access and security are two opposing factors that need to be balanced (by definition, if someone has access to open a door, that door is less secure. The greatest advantage to a master key system is that it provides a great balance between security and access, so individuals are only given the access they need, and the supervisor/manager doesn't have to carry a whole set of keys around to keep the place secure. Of course, the greatest challenge in this kind of system is in keeping the master key(s) secure, so the wrong people do not get access. Mechanical systems require more visits from the locksmith to change locks periodically, and losing a mechanical master key often means all the locks must be changed. Of course, in an electronic access system, a lot of this maintenance can be avoided because “changing the locks” is simply a matter of reprogramming the system. For quality access control and other locksmith services in Reno and Sparks, Reno Sparks Lock & Safe is a family-owned business with a 30-year track record of quality work at competitive prices. For a free estimate on master key systems and other services, they can be reached at (775) 525-5712 —and be sure to check their website for online special offers!